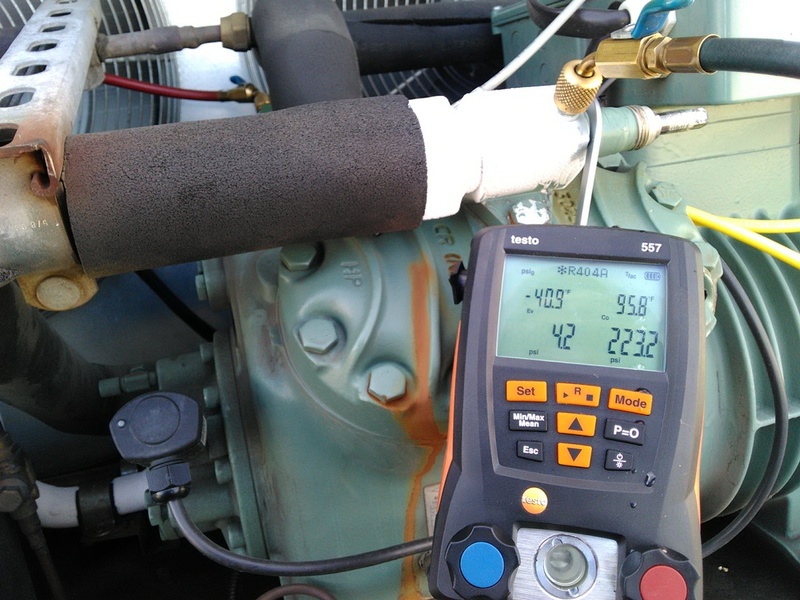 Pumping down a refrigerant circuit is a great way to avoid liquid migration back to the compressor on the off-cycle. Refrigerant will naturally equalize and move to the section of the system with the lowest ambient temperature. If that section happens to be anywhere on the low side of the system, we could potentially have a liquid slug on start up. What is a pump down anyway? A system pump down utilizes a solenoid valve in the liquid line, when the system set-point temperature has been satisfied, the solenoid valve will close. The compressor will continue to pump refrigerant into the condenser and/or receiver, drawing it from the low side of the system. The condenser or receiver or a combination of both must be designed to hold the entire charge of the system. The compressor operation will cut-out once the pre-determined set point of the low-pressure switch, or LPS for short, has been reached. The LPS cut-out setting will be directly related to the application and/or refrigerant being used. In reverse, on a call for cooling, the solenoid valve will open. The refrigerant will travel into the low side of the system due to the pressure difference between the two sides. Once the pre-determined LPS cut-in set-point has been reached, the compressor will start and resume normal operation. Again, the cut-in setting is directly related to the application and/or refrigerant being used. In most cases, this order of operations is automatic and wired as such to perform this task. A manual pump down can also be performed on many systems if a solenoid valve is not present by manually closing the King valve (valve at the receiver outlet) for example. Before attempting this method, ensure that you fully understand this procedure, as damage to system components can occur if performed incorrectly. 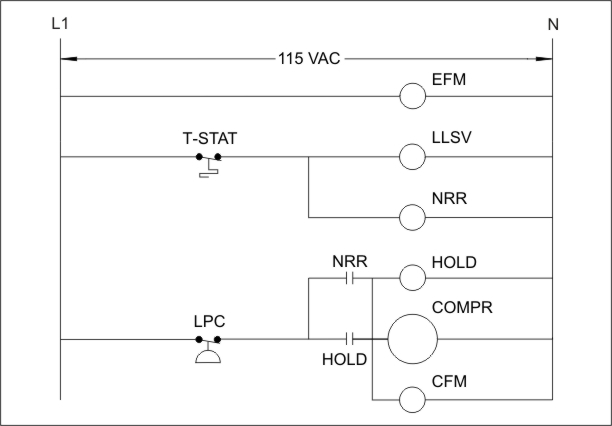 There are two types of pump down circuits, electrically speaking. This is in regard to the way they are wired to operate. The first is the “Recycling Pump Down” circuit. The method of pump down is still the same, using a LPS and solenoid valve. However, if on the off cycle refrigerant is able to creep by internally leaking solenoid valves or compressor valve plates this will increase the low side pressure closing the LPS. In this case, the compressor will start and perform a pump down during the off cycle to ensure that liquid migration is not taking place. A disadvantage with this style of pump down is the potential for increased compressor starts over time. The clear advantage is that your compressor will never start loaded with liquid in the sump. The second type is the “Non-Recycling Pump Down” circuit. Again, the method of pump down is still the same. In this case, if there is any refrigerant migration during the off-cycle the compressor will not start and perform a pump down. Notice the normally open switch (Hold) that will not allow the compressor to restart on the off cycle. The system thermostat must be calling (in the closed position) in order for the compressor to begin operating. The LPS will still close if valves are internally leaking by, but the compressor will not start until there is a call for cooling. A direct disadvantage of this method is quite obvious, the compressor may start with liquid refrigerant present in the sump. 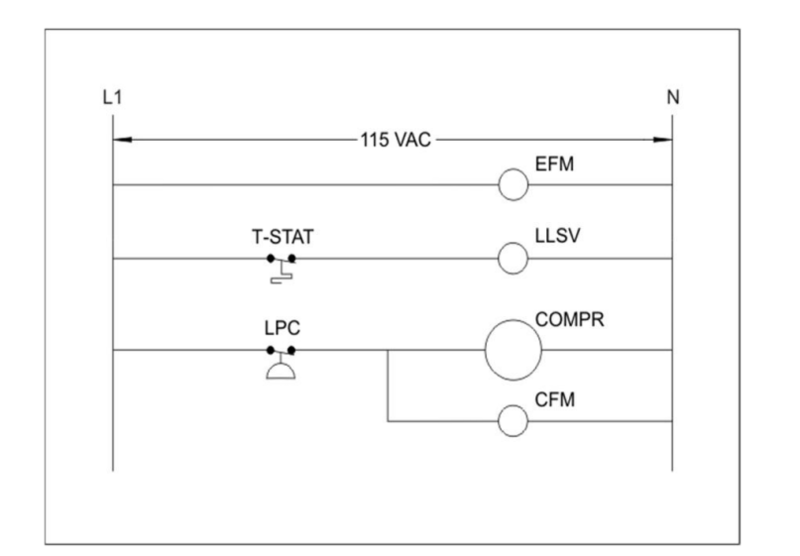 On the other hand, there is the potential for less total compressor starts. Most systems that I have worked on through the years have utilized “Recycling Pump Down”. I find this to be a superior method to protect the system from catastrophic failure. A lot of you might say, “why not replace the internally leaking parts?" On large systems this can be a costly venture, especially if there are multiple parts in question. In a perfect world, all parts would be sealed tight and the fear of internal leak issues would not be a factor. The “Recycling Pump Down” is designed for the inevitable that we all experience daily, flaws upon flaws from system to system. One recommendation I would make, is to employ an adjustable low-pressure switch, this way you are in control and can make adjustments to the pump down cut-in and cut-out as necessary.